Back in 1996 the Renault Scenic was the first compact MPV, inventing the very segment that it went on to dominate for many years. Now in its third iteration, it has even taken over from the full-size Espace in terms of sales and success, and continues to offer families a flexible transport solution. Neat styling, a compact footprint and an interior boasting a huge variety of configurations ensures it will remain a favourite for some time yet. Unlike the first generation, the current Renault Scenic is available in two body styles - the regular Scenic and now the Grand model too. The former has only five seats, but the latter is slightly larger and boasts an extra pair of chairs in the boot, turning it into a full-size MPV inside while still being compact on the outside. As ever Ireland received a rather limited engine range compared to the rest of the world, with only one petrol model (a 1.6-litre four-cylinder unit) offered. Much more common are the 1.5-litre diesel engines. Originally offered with a choice of 85- or 105hp outputs, this later increased to 95- and 110hp. Gearbox choices are even more limited, with manual units exclusively available for the most part of the Scenic’s current production run. Only the post-2011 models could be specified with an automatic gearbox - the electronic dual clutch (EDC) unit. There have been various special editions available throughout its life, including the Royale, Irish Edition and the latest Bose model. However, the rest of the range is a little confusing - some referred to as TomTom, Dynamique or Dynamique TomTom editions. All are well equipped, and the TomTom designated models benefit from in-built satnav. With such a confusing array of special editions and strangely designed trim levels its best to look for the best-equipped model your budget will stretch too. Best off seeking out a TomTom edition too, as the in-built satnav is a useful addition. Both the 1.5-litre dCi diesels will return upwards of 4.9 litres/100km, but the more powerful unit makes the most sense as it is actually slightly more economical. This is especially true if you plan to fill your Scenic with people and luggage - or you need the extra flexibility of the Grand model. 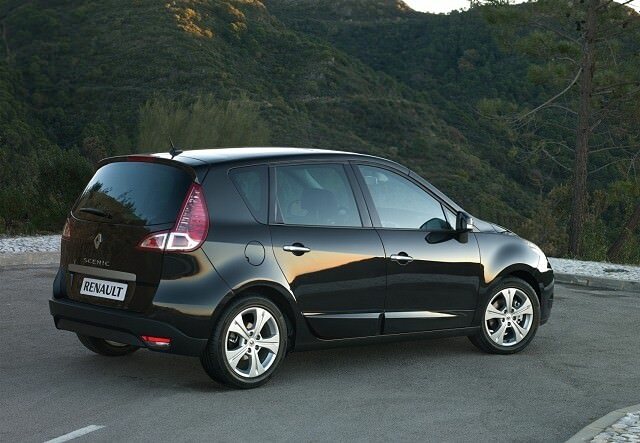 Sometimes the original is still the best, and that’s the case with the Renault Scenic. Yes the Ford C-Max is better to drive and the Volkswagen Touran is better built but with the Scenic you can tell Renault has been making, and perfecting, this car for decades - all the others are merely playing catch up. With a flexible, intuitive and spacious interior matched to distinctive looks, decent equipment levels and willing engines the Renault Scenic is a great all-rounder.